Local Name (Spain): Roquero solitario - "Rock Solitary"
Local Name (Japan): Iso-hiyo-dori (イソヒヨドリ) - "Rocky-shore Bulbul"
Despite the name "Thrush" and the distinctively Thrush like shape, it is actually a member of the old world flycatchers like the robins and redstarts. It is broadly distributed across the Old World and resident across its range, found in a range which extends from Southern Europe to North Africa and across to East Asia. They generally live in mountainous areas where they make their nests in rocky crevices. 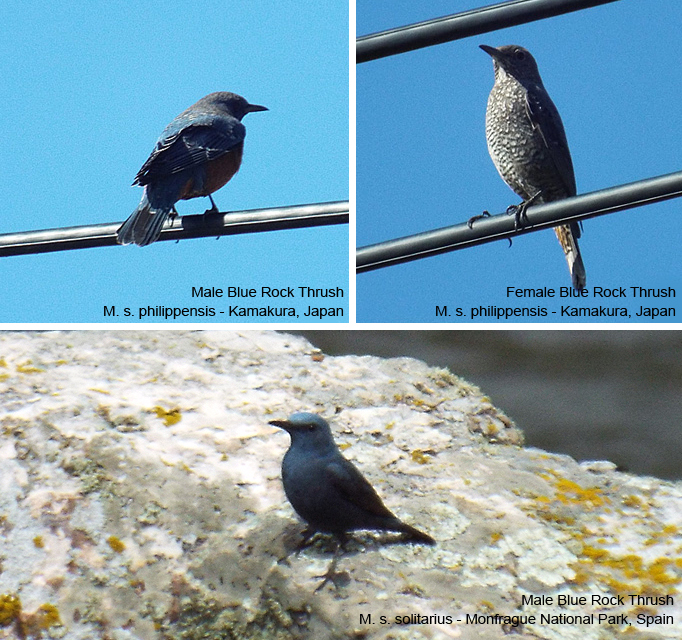 I found this species while following the craggy coast of Kamakura round to a viewpoint for Mount Fuji - a male and two females were living in a short stretch between rocky cliffs and the sea, often alighting on overhead wires.